Great place to chill and relax or have a livelier holiday. Agios Nikolaos is a very picturesque town, the Lake is a very unusual feature; it being like a natural extension of the harbour, crossed by a bridge and circumnavigable by foot. Typically Greek with its bars and restaurants right on the pavement and their ever present employees trying to entice you in. I can see why my niece and her husband chose to get married there, where they met. Some form of motor transport would be an idea for those wanting to explore the wider area. Agios Niklaos is a very attractive Greek town with many good restaurants and plenty of shops to browse. Well located for trips to Spinalonga & Knossos. place plenty of eating places bars and shops. appeal to the young i guess. 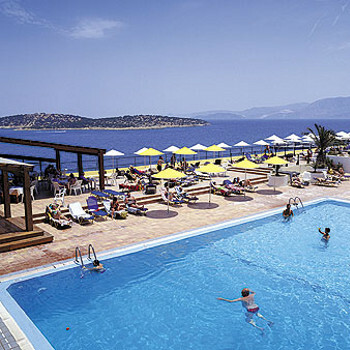 Agios Nikolaus is a busy vibrant resort with a multitude of different tavernas and shops for all price ranges. There were plenty of different things to do from taking the boat to nearby Spinalonga Island (a former leper colony) to taking the road train around the town. The water in the harbour is clear enough to watch the fish swimming along while you sip a Frappe. Litter wasn't really a problem and the streets and buildings seemed very clean. paradise appartments is quite a walk from agios but there are local buses you can catch or a taxi is 7 euros. there is a lovely beach(havania) across the main road from the resort 10 mins away. The resort was very hilly, not for people with walking problems. we found it a bit exspensive in some of the small cafes for drinks, as was a lot of the boat trips etc. Almyros Beach was our favourite beach but is a short taxi ride away. The marina was buzzing at night and there are plenty of bars, restaurants to go to within a short walk. There are plenty of boat trips should you wish, the agent opposite the Armida cocktail bar is very helpful and can arrange a lot cheaper than the reps.
Elounda Village is lovely, it has quite a few tavernas and bars to choose from, but does not feel too much like a tourist trap. There are quite a few shops which cater for the tourists but you didn't feel like it is over run. The local people are extremely friendly. There are quite a few tavernas to choose from for your meals. As you pass each taverna you are asked if you would like to sample their food, but they are not aggressive and when you decline they are still friendly and not at all pushy. The setting in Elounda is beautiful especially if you choose to have a meal at one of the tavernas which is right on the water looking out over the sea and the boats harboured there. There a few public beaches there but we did not use them, but they looked quite clean. We visited Spinalonga Island (was once a leper colony) which is a must when you visit there, very beautiful and steeped in history. We took a boat over there and had a barbeque on a small beach located on Plaka which was very stunning, we had a great day. The only downside to that trip was we only had an hour to explore the island which we didn't feel was enough. I would recommend Elounda only for people who are looking for a relaxing holiday as there is no nightlife there apart from the local bars and tavernas which we really liked.